Pro Libertate: The Awlaki Sanction: Who's Next on the List? The Awlaki Sanction: Who's Next on the List? 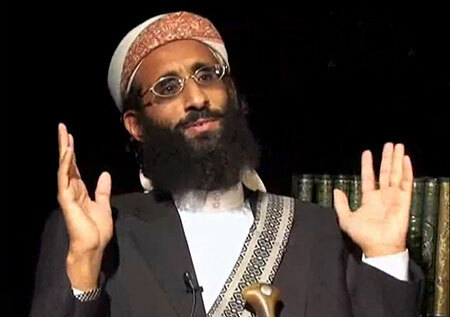 Awlaki -- an American-born cleric who was once courted by the Pentagon -- was accused of expressing support for armed attacks against U.S. military personnel and government interests. It is not terrorism to employ lethal violence against an invading and occupying army, nor is it a crime to express support for armed self-defense -- including armed interposition against the aggressive designs of the U.S. government. There is nothing in the Constitution or laws of the United States of America that permits a president to order the summary execution of any human being. Only Congress can declare war. Only a jury can find someone guilty of a crime. Only a judge can impose a death sentence. Or such would be the case, were we still living in a constitutional republic, rather than the militarist empire into which that republic inevitably degenerated. The vertically integrated murder apparatus that killed Awlaki and fellow U.S. citizen Samir Khan is entirely autonomous – and increasingly automated. Awlaki was added to a “kill list,” and his execution “sanctioned” by a secret legal memorandum, on the basis of things he had said in public. Within a few years, the machinery of mass murder will be refined to the point where people – including U.S. citizens – may find themselves targeted for execution on the basis of behavior “patterns” that suggest unexpressed by impermissible thoughts. According to retired General Wesley Clark, the murder – or, to use his term, “takedown” -- of Anwar al-Awlaki heralds a “transformation” of the Regime’s strategy in waging open-ended warfare. Awlaki’s death “makes his final legacy a proof of the effectiveness of America’s active defense against terrorists,” enthuses Clark. Mere acceptance of the presidential power to execute anybody on a whim isn’t sufficient. It must be celebrated openly – nay, it must be extolled as a selling point to the rest of the world: Come visit this uniquely blessed land of killer drones and murder by executive decree! Inspired by Clark’s exhortation, and eager to display my patriotic zeal to eradicate those who have aided and supported terrorism, I would like to submit two nominees for the next drone-inflicted counter-terrorist “takedown”: Retired Generals Wesley Clark and Michael Hayden. 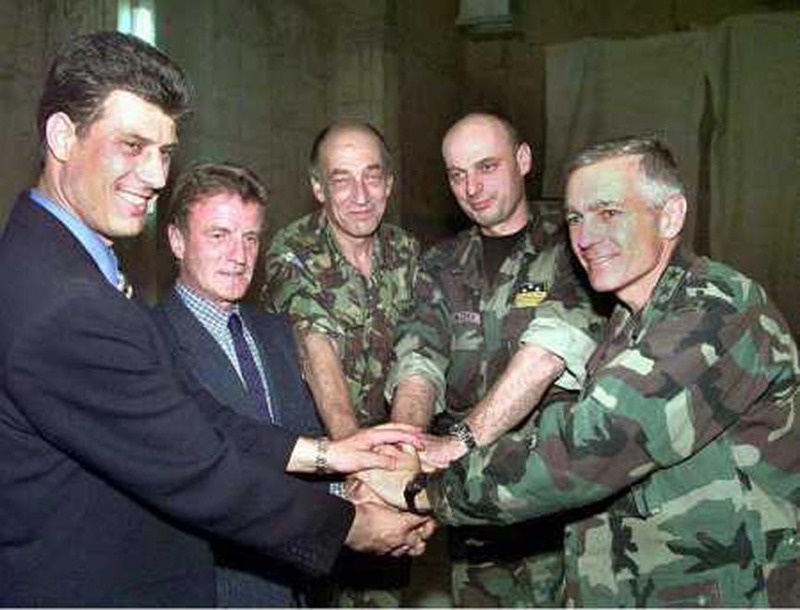 Clark (l.) with KLA chieftain Hashim Thaci (r). As noted above, there is no evidence that Anwar al-Awlaki ever actively collaborated in armed violence by Jihadists. Wesley Clark, however, was the commanding general during the NATO’s 78-day terror bombing of Serbia. Hundreds of civilians were murdered in that act of international terrorism, which resulted in the installation of a criminal syndicate called the Kosovo Liberation Army (KLA) as the government of that Serbian province. The KLA has a remarkable pedigree: It is descended on one side from the notorious WWII-era Skanderbeg militia organized by the Nazi SS; the other half of its heritage is Stalinist. It received material and technical assistance from the CIA , and financial aid from Osama bin Laden -- who were partners in supporting jihadist elements during the wars of Balkan secession. As CIA director under George W. Bush, Michael Hayden was deeply involved in recruiting, arming, and supporting a large number of unreconstructed jihadist, among them an enchanting Somali warlord named Indha Adde, who now refers to himself as Gen. Yusuf Mohammad Siad. Stipulating that the term “al-Qaeda” is, in effect, shorthand for “any group of Muslims Washington has not succeeded in bribing yet,” the critical point here is that Siad openly admits doing the kinds of things Awlaki was accused of doing. Hayden and Clark, on the other hand, have committed crimes well beyond Awlaki’s capacity: As heads of military and intelligence bureaucracies, they offered material aid and support to terrorists. In fact, they – and a number of other veterans of the military-intelligence establishment – continue to do so in retirement. Retired Generals Clark and Hayden are among the War Partyluminaries who are on the payroll of the Iranian Mujahadeen-e-Khalq (MEK), orthe so-called “People’s Mujahadeen,” which is listed as a terrorist group bythe State Department. Clark and Hayden, along with former chairmen of the Joint Chiefs of Staff Hugh Shelton and Peter Pace, former NATO commander James L. Jones, former FBI Director Louis Freeh, former Attorney General Michael Mukasey, former 9-11 Commission co-chairman Lee Hamilton, Rudolph Giuliani, Michele Bachmann, andseveral other luminaries have been hired by the MEK to lobby the StateDepartment to remove the group from its list of Foreign TerroristOrganizations. The MEK was created in 1965 as part of a Soviet-sponsored international terrorist network that waged wars of "national liberation" throughout the developing world. Human Rights Watch, which describes the MEK as an "urban guerrilla group," points out that the group's ideology is a Muslim variation on "liberation theology." In 1970, 13 members of the MEK received training (most likely under Soviet supervision) at PLO camps in Jordan and Lebanon. Upon their return, the PLO-trained MEK cadres shared their newly acquired skills with their comrades, and the group embarked on a wave of attacks and bombings intended to bring down the Shah. 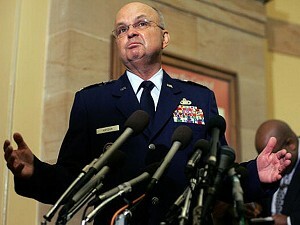 During one rampage, MEK terrorists killed several U.S. military personnel – including Colonel Lewis Hawkins, the Deputy Chief of Military Mission in Tehran. Following Saddam’s U.S. supported invasion of Iran, the MEK began a hit-and-run guerrilla war against the Iranian regime in the hope of triggering a popular uprising. When that proved unsuccessful, the group set up a political front group called the National Council of Resistance in Iran (NCRI) in Paris. In 1985, notes Human Rights Watch, the MEK's "leadership was transformed when Masoud Rajavi announced his marriage to Maryam Uzdanlu.... The husband and wife team became co-leaders" of the MEK and announced an "ideological revolution." Everyday life in Camp Ashraf. All of the group's members were required to undertake an individual "ideological revolution" by engaging in Maoist-style "self-criticism" sessions. Adherents were expected to listen raptly "to radio messages and explanations provided by [their] commanders" in order to "gain a deep insight into the greatness of our new leadership, meaning the leadership of Masoud and Maryam.... To believe in them as well as to show ideological and revolutionary obedience to them." 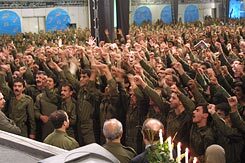 By 1987, the MEK had acquired "all the main attributes of a cult," writes Iranian scholar Ervand Abrahamian, with Masoud Rajavi claiming the titles Rahbar (leader) and Imam-i hal (the Present Imam), and the forerunner to the impending second advent of the Mahdi. In 1994, the House Foreign Relations Committee described the group as a violent, Marxist-influenced cult. The Committee Chairman at the time was Congressman Lee Hamilton (D-Indiana), who is now on the group’s payroll. “Friendships and all emotional relationships are forbidden” to those recruited into the MEK, writes Elizabeth Rubin of the New York Times magazine, who has spent time at the group’s headquarters at Camp Ashraf, 40 miles north of Baghdad. “From the time they are toddlers, boys and girls are not allowed to speak to each other. Each day at Camp Ashraf you had to report your dreams and thoughts.” Maoist “struggle sessions” and severe punishment for “deviationism” are commonplace. Expelled from France in 1986, Masoud Rajavi was welcomed in Baghdad, where he and his followers built a "National Liberation Army" that joined the Iran-Iraq war on Saddam's side. The MEK's plan was to recruit a huge army of suicide commandos whose sacrifice would inspire the “liberation” of Iran. When the war ended in 1988 without victory for Iraq or the "National Liberation Army," the MEK leadership imposed yet another "ideological revolution" on its followers, this one including compelled mass divorces and widespread torture of those suspected of espionage or ideological deviation. Following the first Gulf War, the MEK collaborated in Saddam's crackdown on Shi'ites and Kurds. 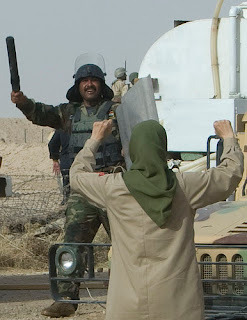 In its campaign to build support for the invasion of Iraq, the Bush administration mentioned MEK camps in Iraq as evidence of Saddam’s support for international terrorism. Following the invasion, U.S. forces disarmed MEK fighters who operated several camps within 60 miles of the Iranian border. Rather than treating them as terrorists, the Bush administration designated the MEK fighters as "protected" persons under the Geneva Convention. In fact, the Bush administration was so intent on sheltering the MEK – which, recall had killed Americans and taken part in the seizure of American hostages – that it rebuffed an offer from Iran to exchange MEK leaders for al-Qaeda suspects being held in Tehran. In exchange for protection, the MEK began to produce a series of lurid – and entirely fabricated – “intelligence” reports regarding Iran’s nuclear program. The MEK has no support among reform-minded Iranians; in fact, the group is immensely useful to the incumbent regime as a way of discrediting its opposition, which in official propaganda is depicted as allies of the bizarre Islamo-Leninist cult. The current Iranian government is awful; if it were to seize power, the MEK -- which is the Persian equivalent of the Khmer Rouge -- would be dramatically worse. As the redoubtable Glenn Greenwald has observed, the retired U.S. officials who have become paid propagandists for the MEK are providing material support for an international terrorist organization. Staten Island resident Javed Iqbal, who operated a cable TV company, was recently convicted of that charge and sentenced to 69 months in federal prison for the supposed offense of carrying programs produced by a television network owned by Hezbollah. And of course, Anwar al-Awlaki and Samir Khan were summarily executed without trial for allegedly rendering the same service to al-Qaeda. Clark, Hayden, and the MEK's other American courtesans are members of the American nomenklatura, which means that they are on the "who" side of Lenin's "who does what to whom" formula. The murder of Anwar al-Awlaki was intended as an object lesson to those of us on the other side of that dichotomy, demonstrating what can and will be done to anyone who is identified by the Regime as what the Soviets used to call a "socially dangerous person." "For the second time this year, Americans can celebrate the elimination of another enemy of the state," proclaims columnist Mark Paredes in Utah's Deseret News. No, seriously -- he really wrote those words. See the blog at LewRockwell.com for my reaction to that Stalinoid screed. During the past couple of months, I've been doing some editorial work and writing for Republic magazine (and some related properties); this explains why my output here at Pro Libertate has declined during that period. This is very much a full-time job -- but, in all candor, it pays next to nothing, which is pretty typical of activist-oriented publications. It is the first regular paying work I've had since getting thrown under the bus by TNA five years ago today, and I'm certainly grateful for it -- but it's not enough to support a family of eight. I recognize that there is nothing unique about our predicament, and that many of you are in similar straits. I would be deeply and abidingly grateful for any help you can provide. Thanks so much for your help in keeping Pro Libertate on-line! God bless. Will, you've covered all the bases with this one and I agree completely. The sad thing is should you have the misfortune of reading through the numerous pig troughs of American public opinion you'd find an incredible number of knee-jerk robots who are more than happy to see someone die "just because". They haven't a clue, and don't seem to give a damn, that in their collectivist hearts they're actually "happy" to sell their birthright for a bowl of fetid federal porridge. No thinking involved. And to further these dolts along are the drum beating propagandists of the major media. Have a thought otherwise? "U mest b a terrist lovin rag 'ed or sumpthin! USA USA USA!!!" Idiocy reigns within their noggins. What this event lays is a foundation for what will come home to roost. It is the opening volley for operations and drones to patrol our own skies. They've already floated articles within the UK and here about this and how local police departments are already testing the waters for these sorts of devices. That's happening today. And to think people actually worry about someone trying to get INTO this country when the day will come they can't get OUT because an eye in the sky spots their heat signature. Terrorist? Clearly anyone "loitering" outside of their permitted assembly zones must be the enemy, or so says the drones algorithm, so "KaBlammm!!" out go your lights compadre. Who needs a fence on the ground, that being so "yesterday", when you can have a killer fence in the sky. Yemen may be on the other side of the globe but it may as well be right next door. Awful as it might be to say it, I find myself now looking forward to the day when numerous flag-waving, warmongering Amoricon sheepletards find themselves as the "whom" and on the wrong end of a regime drone attack. I'd rather they repent. Even Nineveh repented for a while after Jonah's exhortations. Of course, he was telling them God was going to destroy them in 3 days if they didn't. They weren't believers in Yahweh at that time, but repented anyway. Who here thinks our contemporaries who DO claim to believe in Yahweh will repent? I surely wouldn't put my money on it. What crime attributed to Nineveh thousands of years ago isn't an institutionalized, tax-supported policy in this country today? The trigger pulled firing the missile on the drone that killed Anwar al-Awlaki also fired the final bullet into the dying body of the Republic. Madness - and ignorance - takes its toll. Madness on the part of the powers that be and ignorance on the part of the masses. You can not have one without the other. The US now has an assasination process that is devoid of any constitutional authority or judicial process. Whoever is authorizing this,is preparing the US population to accept this process being used inside the USA. "See Something, Say Something" we now have arrived at the Polizei Police state of communist East Germany. Sorry, Linda- no one in this country would believe God, let alone a prophet or angel sent as emmisary from him. We're that decadent, IMO. Will, we all know the 'next' person on the list is a Patriot. It may be you, or Mo, Linda, myself, or any other person you can find who's not swallowing the koolaide swill purveyed by the dotgov. There really is no further proof needed than Jose Guerena, who you will remember well. If a nation expects to be ignorant and free ... it expects what never was and never will be. Have you seen that the drones have their own congressional caucus? via ICYMI. The technology that is already available right now is staggering. From 30,000 feet - invisible to anyone on the ground - cameras can recognize the faces of their targets, compare them with photos using facial recognition software, and identify them to someone sitting at a video console on the other side of the world. The person who pushed the button that killed Anwar al-Awlaki was probably sitting in Nevada, and the video feed was probably being simultaneously watched in the Pentagon and the White House. Big Brother can truly watch you - anywhere in the world. And can snuff out your life at will. There is nowhere to hide. My contact in the CIA says the ID badges worn by everyone in the Pentagon and all the other offices of the security state are recorded by sensors in the doorways and walls, and saved automatically in a database. Anytime they wish, they can query the computer and determine the movements of any individual, moment by moment, for any time period they wish. Not wearing the badge, which can be detected and alarms raised by cameras in the halls, can get you arrested at once. Soon, the day will come when all children will be implanted with RFID chips, supposedly to prevent abduction. In reality, all our movements, and those of every person we meet with, will be retrievable from a database. The power of computer storage doubles every year. Soon it will be practically infinite. Police are already cruising parking lots with cameras rolling. They no longer have to punch license plates into their computers. The computers to which the cameras feed their data will instantly detect the plate of any scofflaw, and beep an alarm. How long before the cameras are connected to facial recognition databases, loaded up with driver's license photos, which will detect any face in a crowd, or walking down the street, who has not filed a tax return, or who has in some way displeased the State? It has been the lesson of history, from the time of the invention of the longbow, to the gun, to the airplane, that any technological advance is used to wage war and to commit murder. Feudal lords, barons, popes, presidents and prime ministers have never hesitated to use these devices against any citizen who threatens their hold on power. Why should pilotless drones be any different? 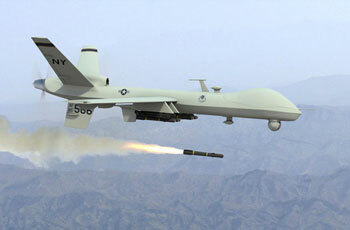 As others have observed, the time will inevitably arrive when our government will use these drones against us. They are already using them along our border with Mexico. Soon they will circle above our cities, watching for large groups of people gathering, and photographing their faces. It is just a step further to fire a missile at them "before they can become violent." I am grateful that I am old enough that I hopefully may not survive to live under such a regime. But I weep for your children, as I have none of my own. You have catalogued a long history of atrocities and horrors by the MEK, which is so beloved of our Establishment. It is violently Communist, rabidly Marxist, has murdered Americans, was allied with "The Vile Saddam Hussein" and supported by him, received training at PLO camps, and committed bombings and terrorism against the Shah, an American ally. (One of the most dangerous positions in the world to be in.) It has all the mind-control hallmarks of a dangerous and violent pseudo-Islamic cult. In spite of all this, MEK is courted and supported by the powerful and righteous in America. How can this be? Let me suggest an answer. In all this catalog of sin which you have listed in your article, they have never committed the one and only sin that matters to our Government. All else, every atrocity, every crime, every crazed belief antagonistic to our freedoms, can be forgiven of a terrorist group by America, except this one act: They have never killed an Israeli, or any other Jew. PPS: Come to think of it, neither did the Kosovo Liberation Army, of which Mr. Wesley "The Harlot" Clark is so fond, or the Irish Republican Army, the old bosom pals of Mr. Peter "The Pimp" King, our present chief crusader against "Islamo-Fascism." Before your readers (especially the Anonymous Lurker,) accuse me of bigotry against those of the Talmudic persuasion, I ask again: Think about that. PPPS: To lighten the mood... Question: Why do Jews have long noses? Answer: Air is free! Question: Why did G-d create Goyim? Answer: SOMEONE got to pay retail, nein? Question: How was the Grand Canyon created? Answer: Izzy Rosenfeld dropped a quarter down a gopher hole. I guess President Mussobama has his death panel. The Patriot Act did more to harm our country then the attack on the World Trade Center. In the name of security we throw out the Bill of Rights that defined us as a nation and join the ranks of Stalinist Russia and Mao's China. They too had their death panels. And how was bombing Libya not a violation of international law? We bombed a sovereign nation why? By the time our fellow citizens wake up it will be too late. May this represent but the first of a continuous serious of malicious code attacks. there are many good words here from everyone, but there's one more word to add to this conversation. i've thought about it for a bit, and i've decided that it wouldn't be merely inflammatory rhetoric to say it.